Posted on May 6, 2016 at 10:00 am. I’d like to talk today about environmental allergies such as allergies to fragrances. 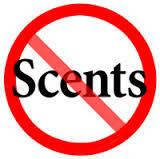 Those annoying signs are everywhere now: Scent Free Workplace/Office/Hospital/etc. I used to wear low-fragrance products, and think I was doing the right thing. After all, if they can’t smell it, it can’t hurt, right? All that changed the moment my body started reacting to chemicals in the air. The first realization was that more chemicals than you can possibly imagine become airborne. That laundry detergent you like to use? Yep. Your shampoo? Yep. Your hand soap and hand sanitizer? Everywhere. Everything you use can affect the people around you because it’s not just chemicals that smell (fragrances) that cause reactions. And it’s not just if that person is close to you, but also if they sit in the soft-upholstered chair you sat in earlier or enter the bathroom stall you just vacated. Remember that person whose smell lingered hours after they left? Yep, just like that. The second thing I realized was that it doesn’t have to be an immediate reaction. In fact, if it’s an immediate reaction to something in the air it’s often considered a sensitivity rather than an allergy. Your sense of smell relies on molecules of each chemical floating around in the air. The orange you are eating releases molecules of itself into the air around you. Those molecules glide through the air on currents, bump into things, settle on surfaces, and go up peoples’ noses, where special receptors at the back of their nose latch onto them and send electrical signals to their brain. Their brain decodes the myriad signals and tells them they’re smelling an orange. People who have asthmatic or anaphylactic reactions to oranges could react immediately from either molecules touching their skin or entering their throat or lungs. But people with contact allergies aren’t immune, as those molecules that were unknowingly deposited on their skin can cause a rash or hives up to a week later. People who have less dramatic sinus reactions aren’t immune either. They’ll be stuffed up by nightfall, possibly feeling flu-like. Washing head to toe and changing their clothing when they get home may not even help, since the damage was done in the seconds to hours the substance was already sitting on their skin, in their sinuses, clothes, and hair. My allergist’s receptionist (who wears large amounts of perfume in the “Scent-Free Office”) actually argued that since I didn’t have asthma I couldn’t possibly have an issue with her perfume. I didn’t feel like taking that moment to teach her how the sense of smell works. Even so, for the sake of sensitive individuals everywhere, please hear me when I say that what you wear matters.